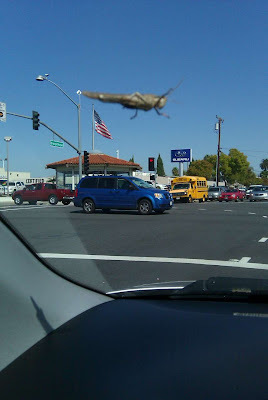 This guy landed on my windshield while I was at the supermarket and hung around, eerily staring at me, for over 20 minutes and the course of two miles. He was either bringing me some crazy luck or planning to take over Fullerton. I am still a 13-year-old girl when it comes to signs, as in "if the next song on the radio is 'I Saw the Sign,' I know (insert boy's name) likes me!" Well, I wasn't planning on it, but Muse played twice, in a row, on two different stations, and it was my favorite song of theirs, "Starlight." Perhaps any luck I garnered was just avoiding that short bus across the street.